Titanium Panerai Luminor Submersible PAM 00025. Case diameter 44mm water resistant to 300 meters. Automatic movement. L- Swiss Black Hobnail "waffle" dial, luminous hour markers and numerals, date display with second sweep sub-dial. Brushed titanium uni-directional bezel. Rubber strap with titanium buckle. Box and papers July 2001. Panerai services papers dated December 2010 and March 2016. Our reference S20064. PAM 25. SKU: 3021247. 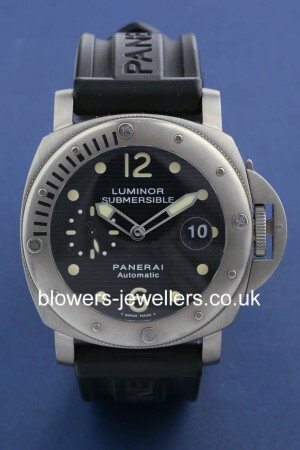 Categories: Luminor Submersible, Panerai.